Marshland: Dreams and Nightmares on the Edge of London | Unofficial Britain. 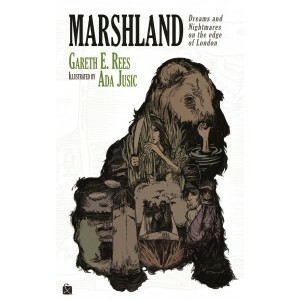 Marshland is a deep map of the east London marshes, a blend of local history, folklore and weird fiction, where nothing is quite as it seems…. “Layered London, black, funny, marshy, full of horrible vigour & hidden channels” – M John Harrison. Cocker spaniel by his side, Gareth E Rees wanders the marshes of Hackney, Leyton and Walthamstow, avoiding his family and the pressures of life. He discovers a lost world of Victorian filter plants, ancient grazing lands, dead toy factories and tidal rivers on the edge of a rapidly changing city. Ghosts are his friends. As strange tales of bears, crocodiles, magic narrowboats and apocalyptic tribes begin to manifest themselves, Rees embarks on a hallucinatory journey across time and into the dark heart of London. It soon becomes clear that the very existence of the marshland is at threat. All around, the developers are closing in.